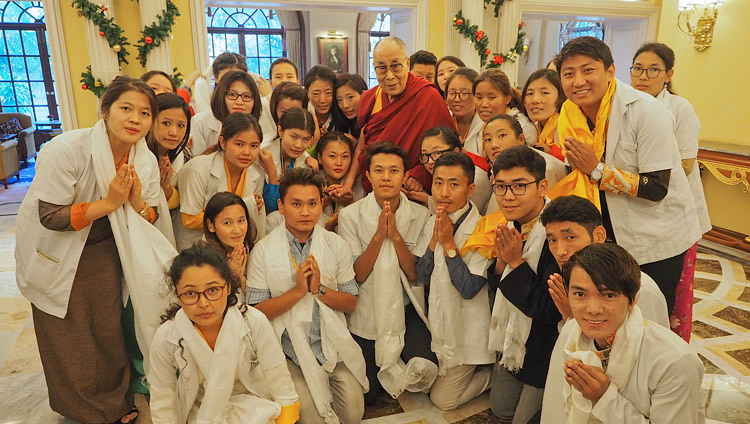 Bengaluru, Karnataka, India – As he was leaving his hotel this morning, His Holiness the Dalai Lama met a group of 25 Tibetan youths who have formed their own health association to help Tibetan patients who come from the Tibetan settlements for treatment in Bengaluru. He congratulated them on their initiative. Arriving at the Tripura Vasini Palace Ground, where the Seshadripuram Group of Institutions Silver Jubilee was being celebrated in a huge marquee, His Holiness was received by Seshadripuram Educational Trust Secretary, Dr Wooday P Krishna. Dr Krishna introduced him to his fellow guest, Dr AS Kiran Kumar, who is Chairman of the Indian Space & Research Organization (ISRO). Together they walked to the stage and a cheer went up from the estimated 14,000 strong audience when they caught sight of His Holiness. Dr Krishna first introduced the Seshadripuram Group of Institutions, which was originally founded in 1930 by two women with an enthusiasm for education. Smt Anandamma and Smt Seethamma started a primary school for about 20 children. Since then, the Seshadripuram Educational Trust has grown to run 26 educational institutions that provide educational opportunities ranging from Kindergarten to Ph.D courses. Today, the total student strength is more than 21,000. The Trust’s motto is ‘To empower every individual with knowledge and self-confidence’. Dr Krishna introduced His Holiness as a messenger of peace and compassion, non-violence and opposition to nuclear proliferation, as well as a spokesman for religious harmony and dialogue between science and spiritual traditions. He referred to him as an advocate of ecology and environmental protection, a defender of women’s rights and a proponent of the Nalanda Tradition. After a pause in proceedings for the lighting of the lamp, Dr AS Kiran Kumar spoke of how science and technology have improved or standard of living and our mobility. However, they haven’t brought much relief to strife and conflict. He highlighted the irony of looking for other planets in the universe supporting intelligent life, while life on our own planet has become so stressful. He suggested we seriously ask ourselves why we are here and expressed his enthusiasm for the Seshadripuram Trust’s decision to invite His Holiness to address students and their families. His Holiness walked to the podium and explained to the audience that he would like to speak from there for a few minutes so that he could see their faces and catch anyone who was sleeping. “Respected elder and younger brothers and sisters, I always emphasize that we all the same in being human, despite whatever secondary differences there may be between us. I don’t make a point thinking that I’m Asian, Tibetan, Buddhist or even that I’m called the Dalai Lama. To do so would be to isolate myself from others and increase my sense of loneliness. To feel that I am somehow special or different from others only provokes anxiety and fear. I’m just another human being. I don’t like formality. There was no formality when we were born, nor will there be when we die. “Here, we are enjoying peace and happiness, while at the very same time, elsewhere on this planet children are starving to death and innocent people are being killed—preventable tragedies. How can we remain indifferent? This is what happens when too much attention is paid to secondary differences such as race, faith and nationality and when we overlook the oneness of humanity, the way each of us is the same, simply in being human. “We all have an innate wish to be happy and to live in peace. We are social animals; we depend on others for our survival. In today’s world we participate in a global economy, while all of us are challenged by global climate change and the threats of an increasing population. I am committed to promoting a sense of the oneness of humanity, which means that each of us has a responsibility to be concerned about others. “I am also committed, as a Buddhist monk, to encouraging harmony among our various religious traditions. They have all brought great benefit to their followers, for each tradition can be a guide to leading a more meaningful life. Some say there is a god, some say there isn’t, yet all our various spiritual traditions convey a similar message of love, tolerance, self-discipline and contentment. They all have the potential to bring about peace of mind through the practice of love. “Of the 7 billion human beings alive today, about 1 billion declare they have no interest in religion, but even among the remaining 6 billion, there are some whose behaviour contradicts their faith. Nevertheless, I am continually encouraged by the way India is a living example that religious traditions can live together in harmony. 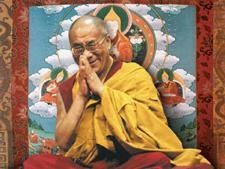 “As a Tibetan, I am committed to the six million Tibetans who place their hopes in me. From a political point of view, I have retired. Since we now have an elected leadership, I have retired and, in the interests of democracy, I have put a stop to any future Dalai Lama’s involvement in Tibet’s political affairs. However, I remain very concerned about protecting Tibet’s natural environment, which makes a contribution to the global climate comparable to that of the North and South Poles. The Tibetan Plateau is also the source of the major rivers of Asia on which more than 1 billion depend for their survival. “I am also dedicated to keeping Tibet’s language and culture alive, since Tibetan is presently the language best equipped to accurately express the insights of the Nalanda Tradition—including a thorough understanding of the workings of the mind. “In addition I am committed to trying to revive ancient Indian knowledge in modern India, knowledge I believe to be of great relevance today. I tease my Indian friends that what we Tibetans know, we learned from you. We are your chelas or disciples, but we have proved ourselves reliable because we have kept this knowledge alive. “In today’s world we face emotional crises, but technological developments alone cannot solve our emotional problems. We can only deal with them by training the mind. We can learn from the psychology of ancient India how to alleviate our emotional turmoil and find peace of mind. The existing system of modern education is largely oriented towards material growth, but we have to include inner values too. Answering questions from the audience His Holiness expressed his hope that India will be able to combine insights from its ancient knowledge with modern education. The widespread pursuit of a calmly abiding mind and insight—shamatha and vipashyana—gave rise to a rich understanding of the workings of the mind and emotions and an appreciation of the principle of causality. He suggested these things can be studied in an academic way such that they can be incorporated into modern education. Asked whether religion or science was more important for young people today, His Holiness answered, both, admitting that he considers himself half a Buddhist monk and half a scientist. He noted that after focusing mostly on the brain alone, towards the end of the 20th century, scientists began to take more serious interest in the mind. His Holiness told a student who wanted to know how to cope with distractions that developing a calmly abiding mind is useful, but that in his own case he feels, even at the age of 82, that his mind remains sharp because he has trained it so long in analysis. He cited the Buddha’s advice not to accept his teachings at face value out of faith and devotion, but to examine and test them to confirm that they comply with reason and logic. This was essentially the approach of Nalanda University. His Holiness advised another student that to cope with sadness our human intelligence allows us to look at events from a wider perspective, to take in other angles. If we are able to do that, His Holiness said that what first appeared sad can turn out to be an unexpected opportunity. He also suggested that in the case of depression, rather than seeking external remedies by turning to drink or drugs, it is more effective to work with the mind. After the Seshadripuram Educational Trust had expressed its gratitude to His Holiness for coming and addressing so many people, the meeting came to an end and His Holiness returned to his hotel for lunch.